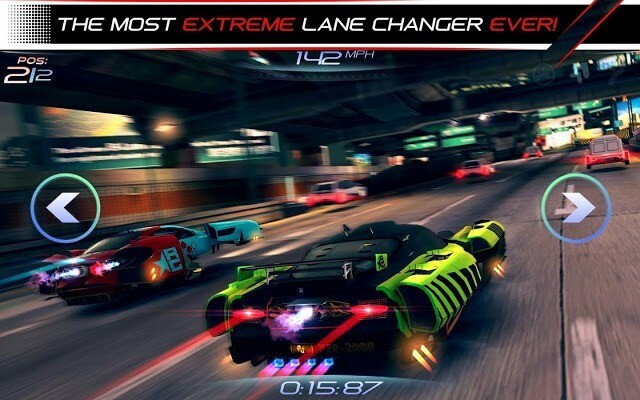 ShortRound Games’ Rival Gears Racing is a stunning adrenaline pumping high-speed racing game that lets you race against AI and human opponents. The best part of this game is the betting system, which allows players to place bets on high-stake challenges, leagues and events. You can challenge real players for cash and glory. The game’s multiplayer mode lets you race against human opponents, but instead of rewarding players for winning a race, it lets players place bets to earn cold hard cash on winning. You will have to accept the challenge and pay the required amount set by your opponent. No need to pay a separate entry fee as the bet you place will be your fee. You can also set your own price for a racing challenge. The race begins when a human opponent places a bet on your challenge. You will find plenty of challenges set by other players, including those that offer lots of cash. Be careful as no player with a mediocre car will set such a higher amount in challenge. You will be up for a real tough competition. I would recommend upgrading your car before placing a bet in such challenges. Chances of winning a race are high if you upgrade your car modules at regular intervals. Without proper upgrades, it would be futile to take up a high-stake challenge and you may end up losing a big bet. The single player campaign mode can be a good training ground for starters. Earning in-game cash can be fairly easy and AI competitors are not tough to beat. Single-player mode also gives you room for experimenting different techniques, such as drifting. While playing, keep upgrading modules at regular intervals to make your car perform better. It will help you tweak your car attributes, which in turn will make it easy for you to win races in multiplayer mode. Keep playing single-player races, earn cash from them and then use that money to place bets on multiplayer challenges. And because the single-player campaign will be pretty easy, you can earn in-game currency easily. If you don’t want to take part in multiplayer mode or the single-player campaign mode, then there’s always your best buddy with whom you can race. There’s no money involved, so no pressure to win or lose any bet. I love this game mode as it lets me learn new techniques and practice a lot before I go for the multiplayer mode. Gain reputation by winning more races. Earning rep will also let you unlock more content. Try not to lose a race. Besides losing cash, your reputation will also be at stake. And if you keep losing races, you may not be able to enter certain challenges until you start winning them again. It can really be frustrating if there are back-to-back losses in Rival Gears Racing. You should better stop playing for some time and race again when you are confident. Once you are confident, play against a friend to practice racing and then challenge easy opponents to regain your reputation.